Fog Computing Market size in 2016 was over USD 9 million, global industry growth is pegged at around 65% CAGR over the forecast timespan. The fog computing market will be benefited by the growing adoption of IoT and M2M devices. IoT is gradually bringing every object in the internet environment, and as the billions of devices get connected to internet, it will become difficult to use centralized servers. Furthermore, there are several applications of the IoT devices in healthcare and energy & utilities sector that require low latency, and any delay in transferring data can hamper the performance. This give rise to the requirement of decentralized computing to scale up the operations. Fog computing is the decentralized computing model that works on the concept that computing of latency sensitive applications can be done on the edge nodes that exist between cloud devices, which reduces the latency and provides enhanced Quality of Service (QoS) and Quality of Experience (QoE). However, security, reliability, and fault tolerance issues associated with the fog computing market model is estimated to be one of the major constraints in the growth of the industry. As it integrates large volume of data from multiple service providers, users, and distributed networks, it is difficult to maintain the security and makes it more vulnerable to cyber-attacks and data theft. Besides, evolution of IoE (Internet of Everything) and 5G technology is estimated to develop numerous growth opportunity for the growth of the fog computing market. Hardware segment is estimated to account for major share in the industry owing to the increasing functionality, low cost of component, and advancement in the design & features. The decline in the price of sensors, semiconductor devices, and storage devices are also estimated to one of the major factor contributing significantly towards the growth of the fog computing market. Furthermore, reducing opex across enterprises due to advancement in the network technology such as 4G and 5G is also estimated to foster the growth. Fog computing market solutions are estimated to grow with the highest rate during the forecast timeline owing to the increasing demand of SaaS and rising adoption in the e-commerce and automotive sector. The sensors are estimated to be the leading hardware component used in the fog computing model. The growth is attributed to the rising demand for decentralized computing, which has given rise to the requirement of a distributed data storage approach. This results in the increasing demand for smart and wireless sensors. Furthermore, the compact size of sensors and high level of integration is fostering the fog computing market growth. 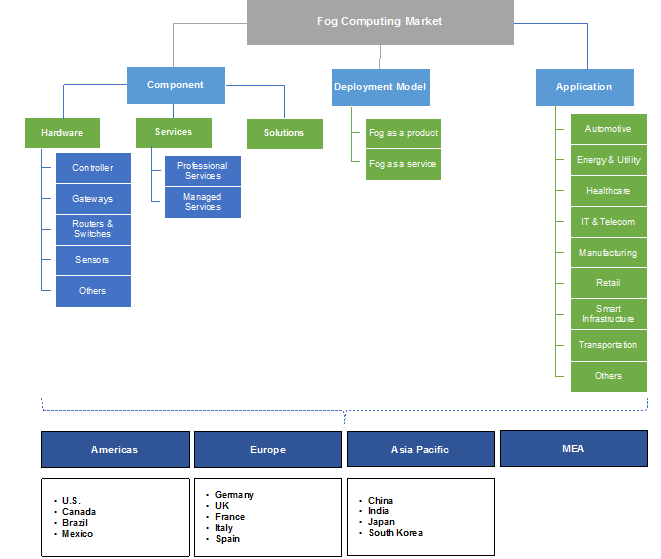 The fog computing market comprises fog as a product (FaaP) and fog as service (FaaS). FaaP is defined as a deployment model, where vendor sells its fog enables product and service to the client. These systems are installed physically on the systems and data is stored on the on-premise servers. Whereas, in FaaS model, the vendor leases out the hardware, software, and service to the application and data is stored on the cloud platforms. FaaP is estimated to be the dominating segment in the industry. As the data stored on the servers are very sensitive, organizations prefer FaaP over FaaS. The energy & utility sector is one of the leading applications of the fog computing model. The growth of the market is attributed to the increasing adoption of the IoT devices. The sector is continuously looking for new ways to improve efficiency of operations, competitive edge and gain market share, flexible smart grid to handle multiple energy sources in bi-directional and decentralized network. Energy & utility companies are leveraging the capabilities of IoT devices to gain deeper level interoperability, automation, and connectivity. Furthermore, IoT devices offer several benefits such as business agility, flexibility, enhanced output, low power consumption, and asset management, that are augmenting their demand in the sector. The U.S. fog computing market is the dominant country in the business, since it is home to numerous key vendors such as Cisco, Dell, IBM and Microsoft. Increasing R&D activities on this model and use of the technology in sectors especially automotive, transportation, and healthcare in the country is also bolstering the growth. Moreover, increasing adoption of IoT devices in the country will also contribute the market in the forecast period. Countries such as India, China, and South Korea will have highest growth in the forecast timeline due to increase in use of connected devices and cloud computing. Majority of the companies present in these countries are SMEs that are expected to use fog computing in 5-6 years, driving the market in APAC. Some of the major vendors of the fog computing market are Cisco, Dell, Nebbiolo, IBM, Intel, Microsoft, ARM, AT&T, Cradlepoint, Foghorn, GE Digital, ADLINK, VIMOC and AppFog. The market players are leveraging strategies such as merger & acquisition, collaboration, product launch, geographical expansion to gain edge over competitors and to gain market share. For instance, Cisco and IBM formed an alliance in 2016 to integrate IBM’s Watson software into Cisco’s fog computing platform. Fog computing is a distinctively niche technology and an extension to cloud computing. It is defined as a decentralized computing platform that extends the service offered by the cloud computing resources to the edge of devices. It provides storage, computing, and networking service between cloud platforms and end devices. These model offers several benefits such as scalability, low latency requirement, optimizing network traffic, which makes it an ideal solution for managing IoT tasks and queries. As the adoption of IoT devices increases, the requirement to optimize network traffic and reduced time for transmitting data between edge devices and cloud computing platform also arises, which is also estimated to drive the growth of the market.